Overdue Update | come blow bubbles! I really have to just stop apologizing for the infrequent posts and accept that as the norm, or get on my game. I’d like to do the latter, but we’ll see. Anyway it’s been since April, so there is a lot of catching up to do. Now, to do an abbreviated catch-all post, or stretch it out over a few posts…how ambitious am I feeling? Decisions, decisions. I’ll start with the present and then hopefully backfill later. SO. Now we begin with today. We spent the morning attempting to put the littles down for a nap (success for Kieran, complete failure for Eleanor, but she was good humored about it all) and then making some homemade graham crackers (yum, I’ll have to find out where my sis got the recipe). Once the other little one got up we let Kieran and Ellie hang out for some quality get-to-know-you cousin time. Needless to say, it was Adorable with a capital A. Notice Kieran holding Ellie’s foot in that last picture? Too cute. 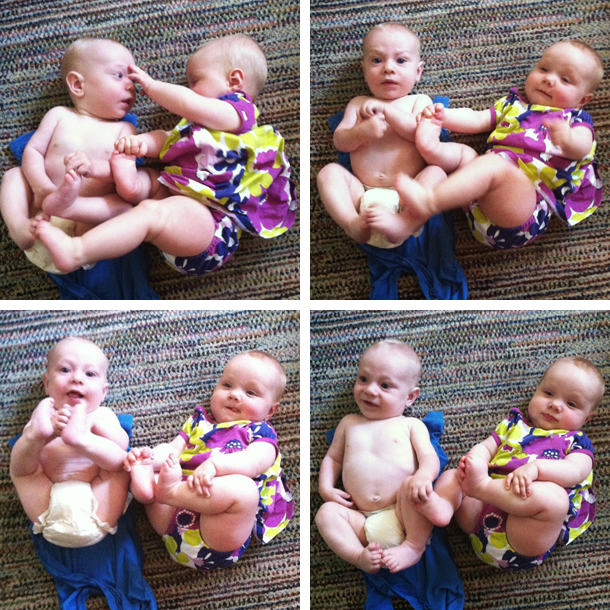 They mainly rolled around grabbing their toes and sticking out their tongues, which made us giggle. Jen got some video, I’ll have to post that once it’s up on the internet. Then came what I call The Great Thigh Comparison. Eleanor and Kieran are around 6 weeks apart and about the same length. Kieran’s hands and feet are bigger than Ellie’s, and Ellie weighs about 3+ pounds more than Kieran, and the circumference of her thigh is about 5x that of Kieran’s. It was ridiculously adorable. And for those concerned, no I am not worried about the size of Ellie’s thighs, or worried that she is overweight. I know once she lengthens out and starts crawling/walking things will thin down. For now, I find them one of her most endearing qualities. I LOVE those thighs. Post thigh time, we headed outside for a picnic lunch where Eleanor actually accepted some solids without tears for the first time–in fact, she seemed to enjoy them. I’m not sure if it was the much more smooth consistency (store-bought instead of home-mashed by me), the flavor (peaches), the setting (on mom’s lap outside surrounded by her Aunt and cousins) or just the fact that she’s had a few more weeks to get used to this new concept, but I was excited. Next came naps for everyone under 4 (some shorter than others, ehem Eleanor) and then the most exciting part of the day: SWIM LESSONS! Claire and Conor have been in swim lessons for a couple months now and I’ve wanted to go watch but haven’t been able to yet. Wednesday night, Jen messaged me and told me that their swim school had a free trial and suggested that Ellie and I come along and participate. Great idea! We picked up Grammy, grabbed some In-N-Out beforehand and then headed over to the pool for some swimming fun. Ellie was a little bit crabby due to her massive nap failures throughout the day, but she seemed to not mind the lesson for the most part, and I think had she been more rested she would have actually enjoyed it. She liked the noodle-floating portion the best. Jen and I died of cuteness. I mean, seriously? Between the bathing suit and those arms out while she floated along…I could barely stand it. All in all it was a fantastic day, and now I’m anxious to find a place to put Eleanor in swim lessons more consistently. thanks Linds! I did find classes at the Balboa public pool, but they were all filled up for the next couple months (not surprisingly). I’ll look into the JCC!